Best Pedal Boats Reviews Spending your summer holidays by a lake is a treat all by itself, but with a pedal boat, you can enrich your experience even more. What’s better on a hot summer day than going out with friends or family members aboard a pedal boat? Unlike surfing, wind-sailing or body boards, these innovations keep us dry like a boat and are environmentally-friendly. This watercraft not only offers us a fun time, but it is also good for exercise as well, since it uses the human “leg-power” as it’s propulsion. The pedal boat normally is designed for two people, but there are some models that hold up to five persons. 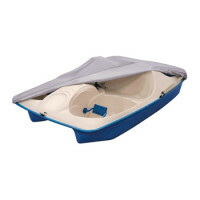 If you are looking for a new way to enjoy the water and tone your legs at the same time, you will like this invention. 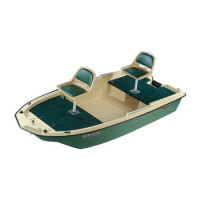 Purchasing a paddle boat is a big decision and you want to be sure you get a top quality boat that will provide entertainment for your family for years to come. 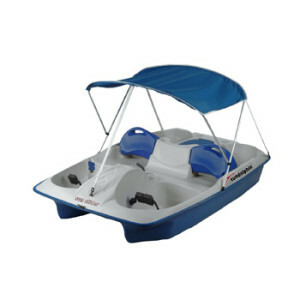 With the following pedal boat reviews, you will “take to the lake” under your own pedal power! Spending your summer holidays by a lake is a treat all by itself, but with a pedal boat, you can enrich your experience even more. First of all, you should know the difference between a paddle boat and a pedal boat. A pedal boat uses pedals, similar to a bicycle to propel the boat. A paddle boat uses paddle wheels, but most pedal boats have paddle wheels for propulsion. A standard pedal boat is powered by people who are using the pedals, which turn a paddle wheel located under the watercraft. Pedal boats are a favorite choice for families mostly because of how simple they are to use and steer, and because they’re safe for the whole family. Both the pedals and the lever for steering are located in the front, so the adults are responsible for navigating around the water and powering the pedal boats, while kids can enjoy sitting in the back. If you’re out on the lake with your friends, you can switch the people who are pedaling so that everyone gets a chance to try. Most of the modern pedal boats have two sets of pedals, which gives the boat more propulsion power, but for even greater power, you can buy a pedal boat with a trolling motor. Note that even some standard models have options for conversions, so you can upgrade them at a later time if you want to do so. With many models to choose from, it can be a daunting task to figure out which boat will work best for you. Pay attention to the following information to help you select your pedal boat. The first thing you should check on, is the material used for the deck and hull. They are both mostly made out of plastic, but there are different types of plastic. Some kinds have better quality and are more durable than other types. The best all-around material is fiberglass. 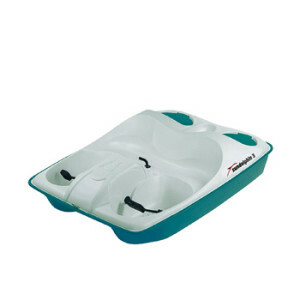 The best pedal boats used for commercial rentals are made of fiberglass because of the material’s durability. A runner up to fiberglass is ABS, a good, hard material that can be sealed well. All paddle boats are designed to have a maximum speed. This maximum speed is usually only a couple miles per hour, which makes the paddle boat safe for the whole family. When you reach the maximum speed, it no longer matters how fast you pump the pedals, because you can only go so fast without additional power from another source. The best pedal boats are designed to be reliable and steady, to makes a family feel that they are safe and in control of the watercraft. This is the beauty of a pedal boat. It is safe and fun. 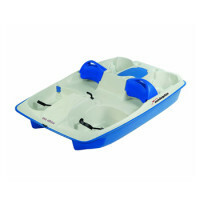 Paddle boats can be different sizes a 2-seater, a 4-seater, or a 5-seater. When it comes to the number of people that could be seated in a specific model, don’t rely only on the number. Always check the maximum weight allowed, to make sure the pedal boat you choose will be a good fit for your needs. 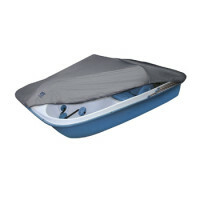 Going over the maximum weight limit could change the safety factor of the boat. Sometimes advertised pedal boats say they can support 5 people. This actually means it will hold two adults and three kids. All pedal boats must have warranty. It may vary from a few months up to six years and must be registered by the consumer. Remember, that warranty is valid only if the product is used for its intended purposes and for which it was designed. There are a few things that will negate a warranty, such as being used for a commercial or rental craft, among others. Check the specifics before you purchase a pedal boat so you feel good about your warranty. The total Reviews Bee rating sums up the overall picture of every product. Reviews Bee works tirelessly to ensure that we are providing the best product recommendations to you and your family. In rating the various pedal boats available, we strive to give you the best information possible.Our algorithm includes information from both expert and consumer resources. There is no need to spend hours on researches, because Reviews Bee instantly gives all researches and analysis for you and creates a Top list to save your time and money. 2. We Analyze the Data Expert Popularity Score, Expert Ratings, Consumer Popularity Score, Consumer Ratings and Consumer Complaints are inserted into our algorithm in order to calculate our Reviews Bee Score. 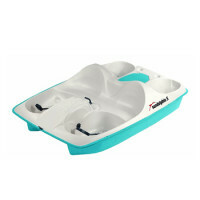 This score, in turn, is used to rank each pedal boat in our Top 10 recommendation. 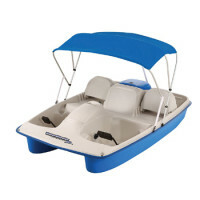 The Reviews Bee score is a summary of each of the most important factors indicating the value of a pedal boat. 3. 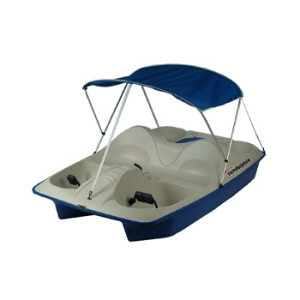 We Deliver The Best Results By taking each of these essential factors into account, we are able to give each pedal boat an overall Reviews Bee Score that ranks each product against the others in our Top 10 list. By using a vast array of expert and consumer ratings, reviews, and feedback, Reviews Bee provides you with the most comprehensive analysis of product information available to you. You can make your purchase knowing that the best research was utilized to make your decision. We came up with the popularity score for every pedal boat provider while analyzing 19 expert sites that are trustworthy. Based on our detailed evaluation, each pedal boat is assigned an expert popularity score based upon how many times each product is positively mentioned by experts in the industry. 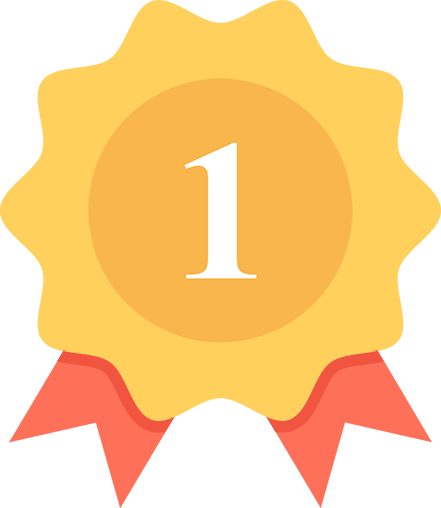 By analyzing all the expert review sites our algorithm summed up the average ranking for every pedal boat in their rankings and that is how we came up with the final score for each pedal boat brand. We managed to gather more than 6650 reviews from 62 reliable sources and our algorithm calculated the average score for each brand. In order to understand how satisfied those consumers were, we analyzed the total number of reviews. We collected all the reviews and the number of stars people gave for each product. Based on these findings we came up with the average customer rating. This is how we managed to bring out the pedal boat reviews through which you know how the consumer can rate the pedal boat. Through this, we show both sides of the product whether it’s positive or negative in nature. This then makes it a negative factor in our algorithm. This as a result makes the best pedal boats reviews. That is why pedal boats reviews not only have positive comments mentioned but also the negatives as well.